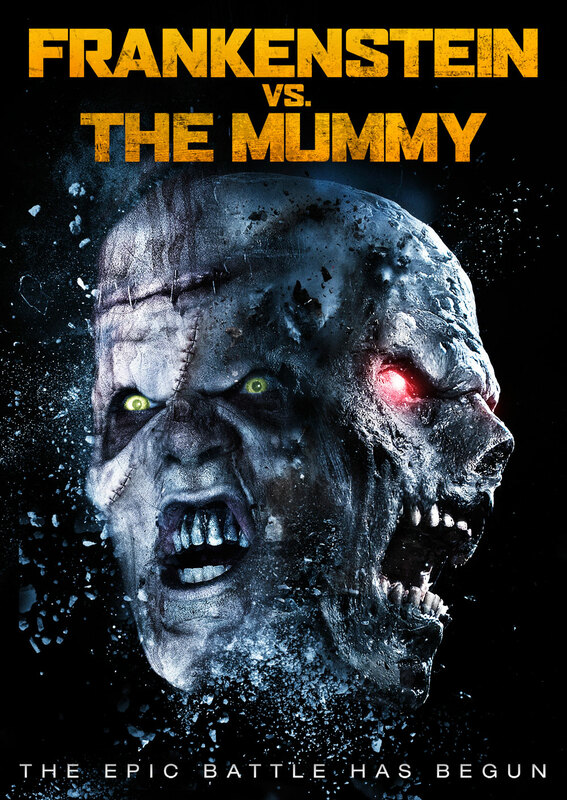 “Frankenstein Vs The Mummy” is the second full length feature from New York based writer/filmmaker Damien Leone, who had previously made the Horror film “All Hallows Eve”. Frankenstein Vs The Mummy follows college professor Victor Frankenstein (played by Max Rhyser) who is trying to balance his life involving secretly carrying out experiments trying to regenerate dead tissue, while at the same time attempting to keep up a personal relationship with Naihla Khalil (the lovely Ashton Leigh), a work colleague whose doing her own study of the mummy of a cursed pharaoh. As Professor Walton (Boomer Tibbs), head of the research department conducts his own analysis of the mummy and Victor takes his corpse to the next level, all hell breaks loose in the university as a showdown between creations ensues. The film also stars Daniel Rodas, Brandon deSpain, Robert MacNaughton and Constantin Tripes. The tale of Victor Frankenstein is hardly an original one, it’s been retold in various ways or style for many years. In Damien’s film, the core character and his rationales remain the same but they’re made a little more interesting by the inclusion of a mummy, as well as the excitement of a head to head. It put’s a very different twist on a classic story, that lately has become quite stale. I really dig the film’s artwork and it’s “Freddy Vs Jason” inspired hybrid. Most of the camera work and shot choices look good and the audio is relatively consistent. This is a low-budget film with minimal locations so cinematographer, George Steuber should be commended for his ability to make the film look interesting while it’s playing out in confined spaces. I noticed that all the scenes that take place in the basement of the medical facility, looked very similar to those in Leone’s earlier film. I thought that aspect was a nice touch, I believe his mother works at a hospital so the basement doubles up and acts as a cost-effective set. The soundtrack was a bit hit and miss for me. The best piece of music was a nice piano ballad that played during a conversation in the car between Victor and Naihla. Overall the score needed to be more upbeat and intense. It’s clear that Damien did his research and spent a lot of time on the script, all the dialogue is well written and most of it realistically articulated. No one can accuse it of skimping on exposition either, which is something these types of films are usually guilty of. I didn’t Google information or history on Pharaohs or Mummy’s after watching the film, so I can’t verify with absolute confidence that everything in the story is fact but I was pretty well sold (haha). It’s refreshing to involve yourself with two really likable lead characters, both of whom are played pretty well by Rhyser and Leigh. They had quite a natural chemistry together and seemed to be having fun. With the exception of a couple of downplayed reactions spread out over the running time, I was genuinely impressed by the duo. Max doesn’t seem like the obvious choice for Victor but ends up carrying himself pretty well. I wasn’t expecting such a brutish figure, I thought that kind of character called for someone far more meek. I’d seen Ashton Leigh in two other films called “Demonic” and “Swamp Shark”. I wasn’t a huge fan of either of the films but her performances were consistently good. Some of her scenes here were very impressive. Her character was the most emotional player and her performance hit the mark when it needed to. The remainder of the cast do their bit but the surprise packet was the janitor, who was supplying and blackmailing Victor with the organs needed for his research. I searched long and hard but the actor doesn’t seem to show up anywhere, nor is he listed/credited for the film. His performance reminded me a lot of Dwight Yoakam’s character Raoul, in David Fincher’s “Panic Room” (a favorite of mine). That controlled type of crazy, crossed with a moment or two of unpredictability made him an enjoyable character to watch, so kudos. This is a clear deviation from the Suspense/Gore based horror that was the focal point in All Hallows Eve, none the less Damien showcases his talent for practical effects yet again. Given the budget the creature effects (for lack of a better word) looked pretty solid. Though it seems that the attention to detail was more of a focus on the mummy than it was on Frankenstein’s monster. The way he was wrapped, the texture of the symbols on the hard exterior and the mask which I assume was latex, all looked authentic. On the other side of the coin, the monster was far more effective when seen in the shadows than actually on-screen. He ends up looking like a rushed version of The Crow meets “Victor Crowley” (the madman from the Hatchet films). I’ve gained a fair bit of insight into how difficult a number of things can be on an independent film, so I have a different outlook on those things nowadays. Knowing Damien, I assume it was a hiccup involving budgetary or time constraints because his work is usually of the highest quality. The opening action sequence looked great, it didn’t hit until about thirty minutes in but it’s well worth the wait. There were a couple of pretty brutal kills, one in particular but I don’t want to spoil it. All the gore effects and gags were done by Damien himself. Some of the lighting was the only technical aspect that I could find fault in. 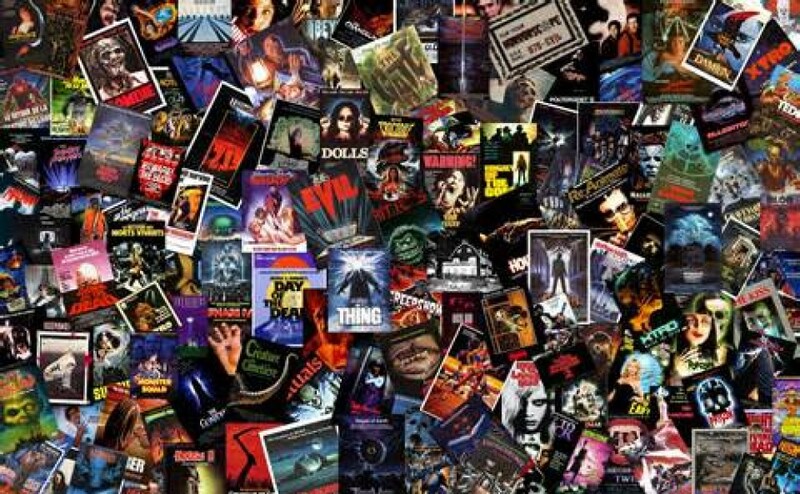 A big part of the reason the film might appear on the low-budget side is due to poor or insufficient lighting. It’s not quite as bad as “Frankenstein’s Army” (possibly the biggest squander of potential for success), which was another low-budget film containing cool monsters, where the crew basically failed to light a single scene appropriately. 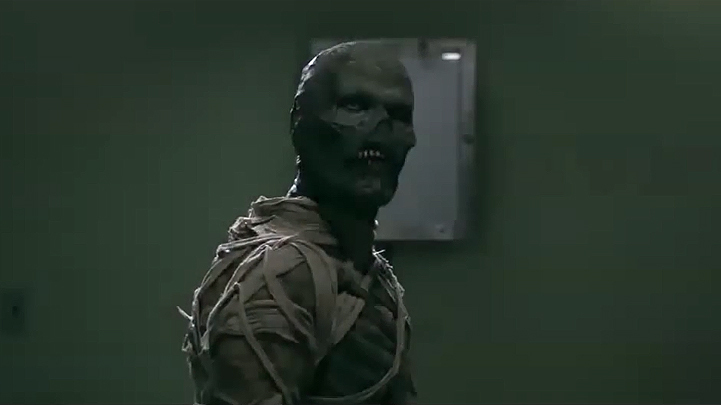 With the amount of time Frankenstein vs The Mummy’s spends in labs, corridors and basements, is it any wonder how difficult it is to showcase quality aesthetics. They don’t make for the easiest locations to light realistically, but even conversations in the car and altercations at the house are far too dark as well. During some of the last scenes there’s some obvious imitation, CG fire which doesn’t look great but because it’s not a huge Hollywood film you can let them off the hook. I also have to mention a sequence involving the Janitor and a homeless man. It’s essentially straight out of American Psycho (in my top 10 films of all time), not that there’s any real issue with that other than it automatically takes me out of the film and into something else I prefer. The way in which the film opens clearly foreshadows some of the problems that will arise between the Janitor and Victor. I liked the first half of the Janitor’s narrative but then things got a little foolish, that could have been written in a better way. There’s only really one conversation throughout the film which wasn’t entirely accurate and it involves Naihla and the Detective. Shortly after the officer has questioned Professor Walton about the whereabouts of one of his students, he asks Naihla a few questions. After they are done talking, she asks him “What exactly did he say to you” (meaning Walton), and the cop proceeded to tell her. By law, he wouldn’t be allowed to divulge any information regarding what was said by any of the witnesses or people questioned regarding the investigation so that’s a bit of a goof. The biggest aspect hurting Frankenstein vs The Mummy is the extended running time and its ponderous pacing. The story is quite slow to get to any real action so for those of you who are waiting for that inevitable confrontation between the Monster and Mummy, you might like to know you’re in for a wait. As far as payoffs go, it will depend entirely on what you expect to see in a Creature/Horror flick made for under $100,000. The battle isn’t exactly Freddy vs Jason but what we do get to see looks pretty cool and again highlights Damien’s experience at more than one facet of film-making, I thought it was fun. I’ve done my best not to be biased when it comes to Frankenstein vs The Mummy because it’s Damien Leone, but in the end I had fun with it. It isn’t the best monster movie you’re likely to see but it’s a far cry from the worst. The technical aspects, the standard of writing and the thoroughly likable characters played by competent actors/actresses, make it a much easier watch than it probably should be. Even though the effects were a little more scarce compared to Leone’s previous work, they were just as bloody and impressive. The monster designs were at the forefront of this unique blend and that made for a nice change of pace. It’s the sour note involving a few revelations in the story and the slow-burn movement towards anything resembling action that stifle the film. Running 114 minutes long, only about 6 of which are spent on the supposed climactic battle between monsters, you can’t help but feel a little cheated. Damien could have tidied this up and done away with some of the over analyzing of information and shortened what felt like some real-time sequences and instead given us more of these larger than life creations going head to head, after all that’s probably the reason you’d watch a film called Frankenstein vs The Mummy isn’t it?